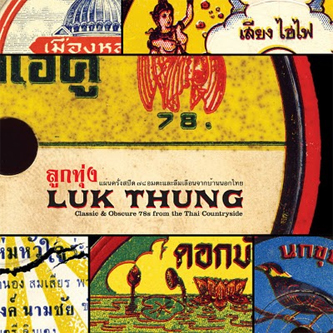 We're not sure what's triggered the influx of classic Thai Luk Thung music compilations (ZRMs bamboo-cased 'The Roots of Thai Funk' and various Sublime Frequencies, Finders Keepers' and Subliminal Sounds volumes), but it's certainly opened our ears to a beautifully altered mode of music that seems famiiar, yet so exotic and alien. The latest appears on Parlortone's ace Dust-To-Dgital series, preserving "fourteen funky, down-home songs from the 1960s, the Golden Age of Thai Country Music" accompanied by extensive, full colour fold-out sleevenotes. To give a glib overview of the sound, it's essentially a syncretic form of folk-pop previously played extensively in one of the most Westernised countries in Asia absorbing elements of imported pop and spicing it to local tastes with traditional Thai melodies and distinctive accents. There are 14 tracks included here, each a precious example of soul-tugging, grassroots music from a fascinating and endearing part of the world.